The Pike County Conservation District held their Annual Dinner on November 8, 2013 celebrating forest landowner initiatives and recognizing a long time District Director who will be retiring at years end. Chairman Savini, the District Board and the Pike County Commissioners recognized District Director Roy Borgfeld for his 16 years of volunteer service to the Pike County Conservation District at the evening’s festivities. Prior to joining the District in 1997 as an Associate Director, Roy Borgfeld, a resident of Lehman Township, was instrumental in a county-wide visioning process supported by the Conservation District and also served on land use planning and environmental task forces in the community. As an Associate Director, Roy spearheaded efforts to develop and track a detailed Long-Range Plan for District operations and supported District programs focused on educating county residents and municipal officials on issues such as open space conservation and conservation design for commercial development. Roy served as District Chairman, Vice-Chairman, and Treasurer and played a key role on a number of committees during his tenure with the District. At the dinner, Roy also received citations for his dedication and volunteer service from State legislators and Governor Corbett’s office. 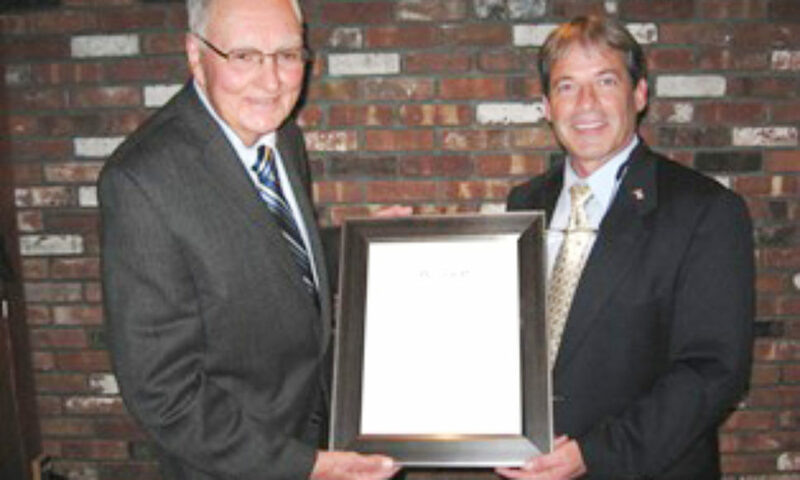 Roy is pictured in the photo to the right with Board Chairman Scott Savini. Chairman Scott Savini began the evening thanking the many partners who work closely with the District to provide forest conservation education and implementation of forest practices on the land. District Executive Director Sally Corrigan and Delaware Highlands Conservancy Stewardship and Education Coordinator Amanda Subjin provided an overview of some of the forest initiatives and the benefits they provide to private forest landowners. The initiatives discussed at the dinner included the development of the Pike/Monroe Woodland Owners Group, the Common Waters Partnership and Fund, the Shop Local Save Land Forest Products guide and the Women and Their Woods program. Several of the landowners currently participating in the Common Waters Fund program were acknowledged at the dinner. ← Pocono Source Water Protection Collaborative Gets Underway!